I mentioned Obsidian in Friday’s post. 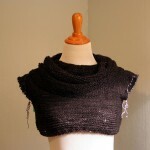 I love the clean, modern lines – it really shows off a hand dyed. When I wrote that post I had no intention of casting on the next day. But then I got a text from Paul on Friday that his company’s Christmas party was Friday December 13th. 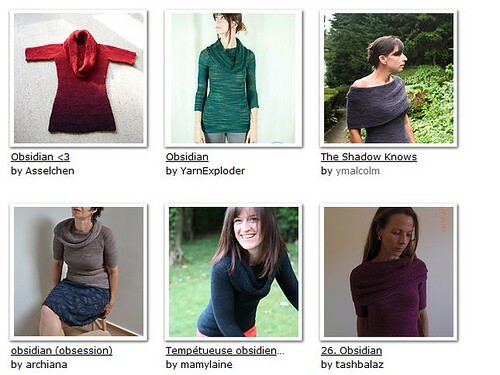 I obsessed the way I always do about what to wear – never considering knitting something because, well, it’s a month away. But once I remember Obsidian I couldn’t stop thinking about it. 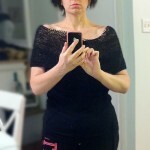 I needed to wear Obsidian for that party. I love the cowl pulled all the way down. It’s what sold me on this design. The pattern is pretty simple too. If you’ve ever made a top down raglan you should have no trouble with this. After reading lots of people’s notes I learned that a *super* stretchy cast on was needed for the start of the cowl (the part that stretches around your whole body) so I went for Jeny’s Stretchy Slip Knot Cast On. I didn’t want to take a chance that the star of this design wasn’t going to work. Since this will be an aggressive (but doable, right?) deadline I psyched myself up with a look at some of the FOs. Here are a few of my favorites. 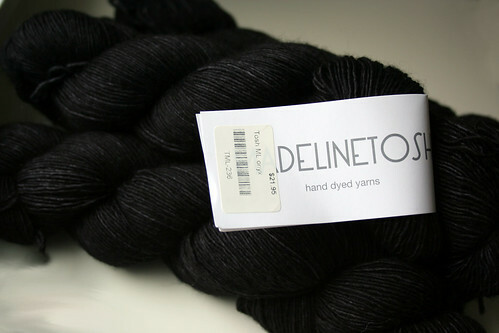 As for my Obsidian, I went with 4 skeins of Tosh Merino Light in Onyx. Paired with a slim fitting black skirt and black knee high boots, it’ll be a modern take on the little black dress. 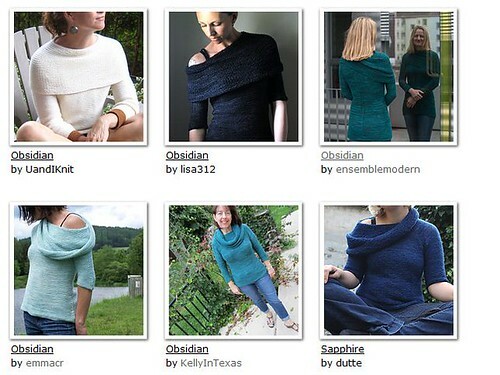 sweaters, WIPs - 2013 obsidian. permalink. You can do it Jody! Is going to be super chic in black! I hope we get to see pictures of the whole outfit when you are done with Obsidian. I always feel so challenged when it comes to putting together a nice outfit and what you’ve described sounds wonderful! Sounds and looks great! 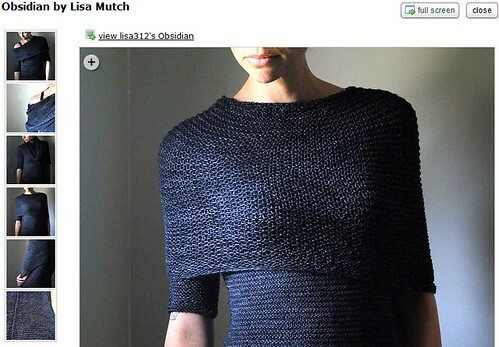 Knit on! BTW, did you start Sprig? That’s a nice pattern also…. 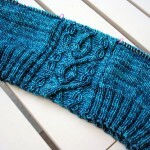 I can’t wait to see the FO! Also, thanks for the new-to-me cast on tutorial video.